January 16, 2014 - "New Product Release"
Ashtabula, OH: Now avid poker players can go all in – to the pool! Custom rotational plastic design and rotomolder Meese Orbitron Dunne Co. (MOD), Ashtabula, Ohio (www.Rotomolding.com) has introduced Texas Floatem. Designed to enable poker and other card games to be played while in a swimming pool, the new Texas Floatem features a one-piece, rotationally molded plastic (HDPE) card table that floats on the water yet keeps the cards and chips safely corralled. Waterproof and UV-resistant, the Texas Floatem pool game balances strength and durability to last year after year while achieving proper buoyancy for enjoyable gameplay. 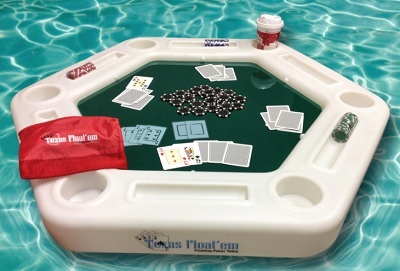 Sized to accommodate up to six poker players, the Texas Floatem water game is designed with a molded-in cup holder and recessed chip rack for each player and comes with a deck of waterproof playing cards and plastic poker chips. To capture the visual appeal of a traditional poker room table, the Texas Floatem includes a green Plexiglas sheet that fits neatly into the center and stays in place even amid waves and splashing in the pool. Texas Floatem is available exclusively via the Frontgate catalog and Frontgate.com.